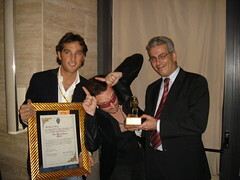 The City of Turin in Italy awarded Bono with Honorary Citizenship on September 15, 2003. City representatives were finally able to present Bono with the deed in Milan after U2’s show on July 20. Nelson Mandela and Bishop Tutu are among previous honorary citizens of Turin. Bono is lauded for playing Kosovo stadium and donating the proceeds of that show to reconstructing the hospitals in Sarajevo, for his work on Jubilee 2000, Net Aid, and DATA. – View a copy of the City Council’s ‘Motion N.33’: Download pdf. 125 Million euro for this tour alone, and he still can’t afford to buy himself a dress shirt. Poor chap! PS, do you guys think he brushes his chest hair? oh go easy on him. can’t we leave the hair jabs to cretins like henry rollins? nope, they played KOSEVO STADIUM in 1997, which is sarajevo´s stadium! great great moment. I’m really happy for him, it’s amazing all the things that he had done in his life, I guess that it’s why he TOTALLY deserve that status!!! Bono is amazing, I’m really proud, for you know, be a part of the U2-fan, if I can say!!! So that citizenship makes me really happy!!! Thank God we have BONO!! !